Powerful and versatile insecticide containing natural pyrethrins, synthetic permethrin, and natural piperonyl butoxide. 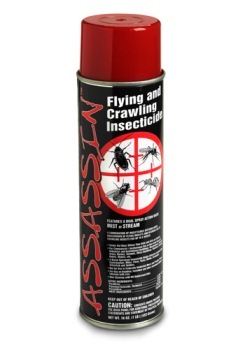 Kills flying insects on contact and provides residual kill of crawling insects for up to six weeks. Safe enough to use on bedding and furniture to kill lice and louse eggs. Strong enough to kill cockroaches, spiders, ants, mosquitoes, flies, ticks, scorpions, and over a dozen other flying and crawling insects.